Heat a 12-inch heavy-bottomed skillet or cast iron pan over medium heat. Spray with non-stick cooking spray. Season chicken with salt and pepper then add to pan and brown on both sides, 2-3 minutes per side. Transfer to a plate. Add onions to pan and cook until softened, 2-3 minutes. Add garlic and cook another 30 seconds. Add chilies, broth, tomatoes and half of the tortilla chips to the pan. Then, nestle the browned chicken into the broth and cook until a thermometer reads 165 degrees when inserted into the chicken (or until chicken is cooked through), about 8 minutes. Remove chicken from pan, cut into smaller pieces then add back to the pan with the remaining tortilla chips and about half of the cheese. Stir then cook until the chips are moistened. Top with remaining cheese then cook under the broiler on high until cheese has melted and begins to brown. Serve with cilantro sprinkled on top. Cinco de Mayo is comin' up! 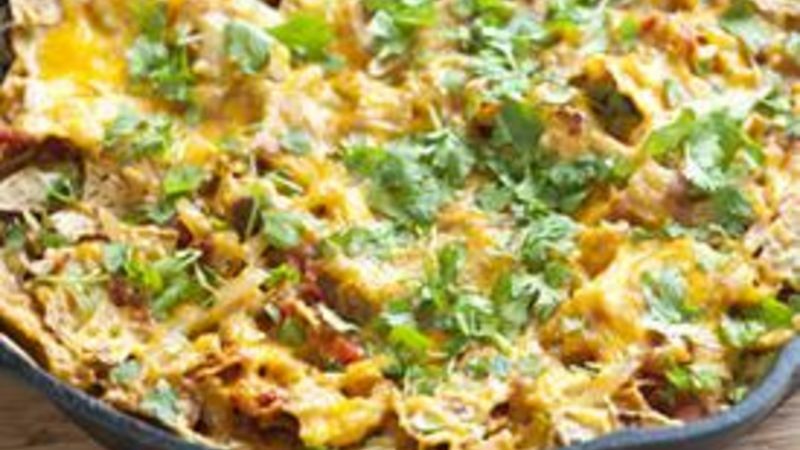 Here's a quick Mexican casserole that'll nod to the holiday while feeding the whole fam. If we were to tell ya that a bag of baked tortilla chips can be totally transformed into one seriously amazing family-friendly meal, one that you’ll be thinking about days after eating it, would ya believe us? Well, we hope so because that is exactly what we’re telling ya! Baked tortilla chips + a few things from your pantry + one pan = Easy Chicken Tortilla Casserole for Cinco de Mayo. Oh, yeah… and it only takes 30 minutes! We went ahead and worked from another yummy recipe originally from Eat Better America that uses a ton of yum ingredients like cumin, corn tortillas and sour cream. It all starts with boneless chicken thighs. You could use chicken breasts, but the thighs just have SO much more flavor. Give ‘em a sear on both sides and reserve for later. After that, add a bunch of sliced onions and garlic -- cook until soft then pour in some tasty Progresso chicken stock. Next, up? Some spice, of course. Add a whole can of green chilies to the pan along with a can of tomatoes and the chicken we browned earlier. Now, a couple handfuls of broken up tortilla chips go in. We’ll add more chips later; these are just going to break down a bit, soaking up loads and loads of flavor, which leads to loads and loads of smiles when we’re done. Remember the chicken we nestled into the pan? Once it’s cooked through, whip it out and chop up into bite-sized pieces then throw them back in with more chips and some cheese. Last step? Top everything with more cheese and slide it under the broiler to get all melty and golden brown. Sprinkle the top with some cilantro and dive in to one family-friendly, Mexican-inspired casserole! Adam and Joanne think that once you’re plate is all licked clean; you’ll definitely want more. For more inspiration, visit them at their blog Inspired Taste and their Tablespoon profile.